The legend, rehashed by conspiracy theorists in countless documentaries, revolves around allegations that an unusual object fell from the sky — an object so bizarre that the U.S. Air Force issued a press release that a flying saucer had crashed. 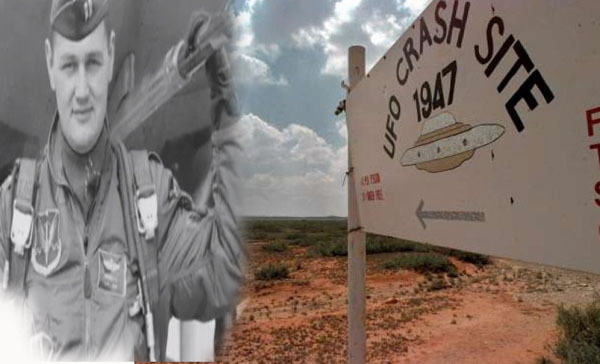 French — an Air Force pilot who was in Alamagordo, N.M., in 1947, being tested in an altitude chamber, an annual requirement for rated officers — was very specific in how the military allegedly brought down what he believes was a spacecraft from another world. “When they hit it with that electromagnetic pulse — bingo! — there goes all their electronics and, consequently, the UFO was uncontrollable,” said French, who flew hundreds of combat missions in Korea and Southeast Asia, and who held several positions working for Military Intelligence. Another retired officer doubts French’s story. “No chance! Zero chance!” said Army Col. John Alexander, whose own top-secret clearance gave him access in the 1980s to official documents and UFO accounts. He created a top-level group of government officials and scientists who determined that, while UFOs are real, they couldn’t find evidence of an official cover-up. “In the 1980s, I was the guy developing all of the pulse-power weapons systems. We couldn’t have done it then. In the 60s, they had a laser system, but your range was extremely limited, and we didn’t have operational laser weapons in that time frame,” said Alexander, who is working to get amnesty for military personnel who wish to talk about their UFO experiences. But after eyewitnesses — including numerous military personnel — began to tell stories of their participation in an alleged cover-up of the Roswell incident, some researchers insisted that it was, in fact, an alien ship that crashed at Roswell. French says he was told about the UFO “shootdown” by another military officer — a confidential source — from White Sands Proving Grounds, an area of the New Mexico desert where the U.S. military tested many weapons systems. His source told French there was a second UFO crash near Roswell a few days after the first one. While French offered no further details on what he says was a second UFO crash, he teased something else. That story set off a fury of controversy between those who believed and didn’t believe Brandon’s story. And now we have French, who served more than 27 years in the military, including as an investigator and debunker for the Air Force’s famous study of UFOs, known as Project Blue Book, which began in 1947. “I’m one of the authors of Project Blue Book, and started with the Air Force Office of Special Investigations, stationed in Spokane, Wash. One of the duties I had in 1952 was to debunk UFO stories,” French said. But why was French ordered to debunk UFO reports in the first place? As it often turns out with eye-opening UFO stories, it comes down to who you believe. Antonio Huneeus is a 30-year veteran UFO investigative reporter who recently spent time with French and is trying to uncover more facts about the information the former Military Intelligence officer would have us believe. “We did a search and found his name on an official Air Force page that confirmed he was a combat pilot, but that page had nothing to do with UFOs,” Huneeus, editor of Open Minds Magazine, told HuffPost. Sixty years after French began investigating UFOs for Project Blue Book, he still thinks there’s a cover-up.